Great Britain’s currently busiest international gymnast Kelly Simm, comes to the end of her most recent run of international competition at the world university games in Gwangju Korea beginning at the end of this week. 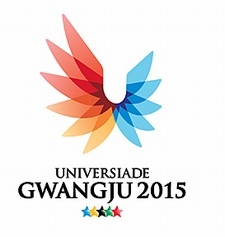 The games open on Friday 3rd of July, with the artistic gymnastics opening with qualification on the Saturday the 4th. Obviously not a hugely UK friendly schedule, but the AA final is at a watchable time, and hopefully videos will be popping up on YouTube. ii) Former students of the institutions mentioned in (i) who have obtained their academic degree/diploma in the year preceding the event. i.e. students graduating in 2013/14 are eligible to compete. In addition to these requirements, British gymnastics set the requirements that an AA score of 50.00 or over must be attained at any of the qualifying events ( BUCS Gymnastics Championships 2015, Senior British Gymnastics Championships 2015, Senior English Championships 2015) , or for gymnasts competing on two pieces, an average of 13.50 on both. Gymnasts on the GB high performance program would be automatically selected, gymnasts not on the program could petition the nomination panel. Gymnasts at University abroad could also petition for inclusion. Worth noting is that only gymnasts in the 2015 Great Britain senior national squad would be fully funded for this event, which narrows the field considerably. Kelly is studying Applied Sport Science at Southampton Solent University, and I think at present she is the only one that fulfills the entire criteria. Lets take a look at who is competing in which groups, there are two Czech, and one Uzbek, Mexican, and Croatian gymnasts yet to be announced. Lauren Mitchell – Lauren was scheduled to compete but unfortunately is unable to due to injury. Speculation is so full of ifs and buts, so dependent on so many gymnasts, and so many factors that it is often fairly pointless. You can speculate on results should everyone hit, but everyone rarely does. That said, looking at the field, Kelly will hopefully fare very well at this competition should she compete well. AA is difficult to predict not knowing which of the gymnasts are competing AA. We know that Mary Anne-Monkton is not, so must assume that Georgia-Rose Brown and Emma Jane Nedov from Australia are. Other than that, we can only wait and see. Going clean, Kelly could finish highly AA, as well as likely finals on vault, bars, and floor, where her strongest performances could definitely see her bringing home medals. June 30, 2015 in Competition. ← Baku 2015 Finals Report.